That cover made me check the prices of old Monster In My Pocket sets on Ebay. Then I balked at the starting bids, read the book, and got far more fun out of it than if I’d spent the same amount of money on stale plastic figurines. The only accurate description I can come up with is that it’s like if P.G. Wodehouse did a line of coke off of a Hot Fuzz DVD. 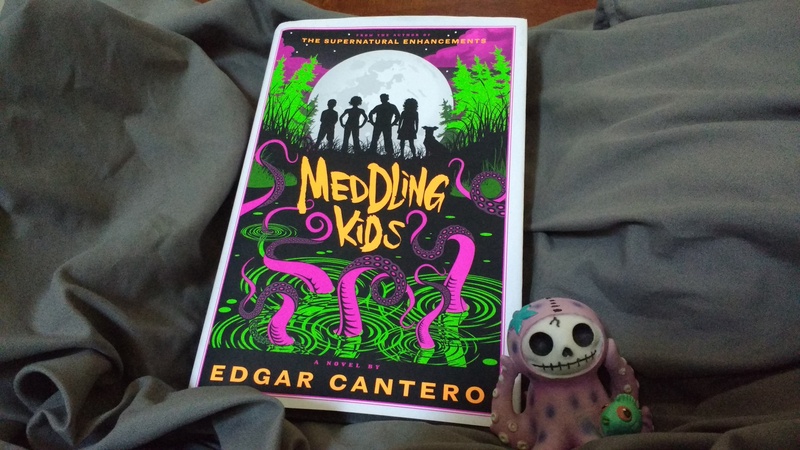 Meddling Kids avoids a problem I have with some modern Lovecraftian fiction: a lot of it relies on powerful sanity-shattering knowledge that’s been kept secret from the world, and secrets doesn’t stay secret for long when there’s an Internet. Meddling Kids avoids this by being set in 1990, just recent enough to feel contemporary without leaving us asking why there aren’t scans of the Necronomicon up on Pirate Bay for anybody to download. But it doesn’t beat you over the head with ninetiesness and fall back on lazy nostalgic references for its comedy. Instead, its humor comes from colorful characters coping with mind-bending horror and gleeful disregard for writing conventions. The biggest thing that you’ll notice about the book is how loose it gets with language and formatting when there’s fun to be had through breaking fundamental rules. Descriptive portmanteaus are rampant, and the text occasionally slides into chatroom format when characters are talking rapidly to/overtop one another. This might have been annoying if it were trying to make some high-falutin’ metacriticism of the deontological nature of structuralism (or whatever term you’d use to describe someone from an MFA program doing the same thing,) but this is a novel that features a supersonic nut-kick and a Rube Goldberg-style escape from a mental asylum before page 50. If a misexpected text-thing happened I just took it in the joyful stride with which the book carries itself and kept reading with a slightly wider smirk. “Tragichuckle” is going to make its way into my regular lexicon whether the other words like it or not. For all the rules it breaks, Meddling Kids sticks with one: having characters to root for and occasionally want to high-five. Andy gets the most attention as a pugnacious badass, and her relationship with Kerri feels surprisingly authentic for such a light book — Kerri has her own feelings and desires and isn’t just a trophy to be awarded when Andy kills enough fishpeople. Neither is she sacrificed for cheap Bury Yer Gays pathos, which is one trope I’m really glad to see authors yanking out of the spotlight with a crooked cane. But for all the good it does kicking back against insensitive cliches and stuffy English teachers, Meddling Kids doesn’t stop the comedic action to get on a soapbox at any point. It’s seriously the closest thing to a Jeeves & Wooster-style relentless stream of whimsy that I’ve read outside of those books themselves. I give it a rating of five nearly-sentient hairdos out of five, which I couldn’t possibly begin to provide graphics for.